Does your pet just need a nail trim? No problem! Our veterinarians perform nail trims on cats, dogs, rabbits, guinea pigs, ferrets, and birds both small and large. If your parakeet, conure or cockatoo needs a beak trim or wing trim, we can do that too! Appointments are required, and may be limited for exotic pets based on the availability of the veterinarian, so please do call ahead. PLEASE NOTE: effective January 2019, Bellevue Animal Hospital will require that any cat or dog who visits our hospital for a nail trim appointment must be up-to-date on its Rabies vaccination. This new requirement is to ensure the safety of our staff, of you and your pet, and of our other clients and patients. Rabies vaccinations are required by law in our area for all cats and dogs over the age of 4 months, and the vaccination must be kept current. (Rabies vaccinations are first given between the ages of 12-16 weeks, again one year later, and again every 1 to 3 years depending on the vaccine used.) If your pet received its vaccination at a hospital or clinic other than our own, please be prepared to provide us with a Rabies vaccination certificate that includes the name and license number of the vaccinating veterinarian; this certificate must be presented either prior to or at the time of your appointment. A rabies tag is not sufficient proof of current vaccination status and will not be accepted as such. If you have any questions, please give us a call at 402-291-1255. Is your cat’s haircoat out of control? Too many matts for you to brush out comfortably? If your kitty won’t tolerate grooming, our team can shave your pet’s coat. 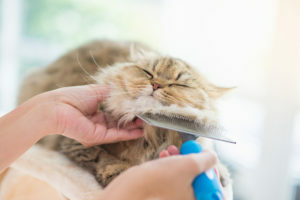 A full shave – typically a “lion cut” which leaves the fur on the head and neck, tail, and paws – is performed with your pet under general anesthesia. At least one member of our medical team will watch over your cat throughout the procedure, and we will also use our Advanced Anesthetic Monitoring system to ensure the safety of your pet. Pre-anesthetic bloodwork may be recommended or required, depending on the health of your pet. Cats scheduled for a shave must be current on their Rabies vaccination (see above) and must have been seen for a physical exam by one of our veterinarians within the past four months. For an estimate, please contact us by phone or email.